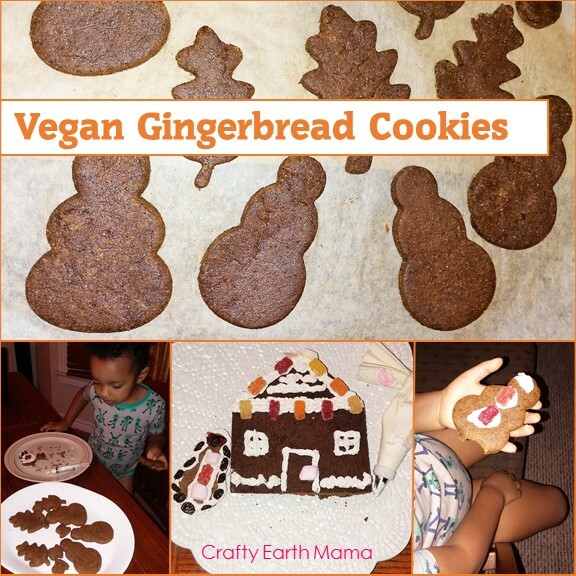 What's the Holiday Season without gingerbread cookies or any cookies! It must be the weather and festive feeling at this time of year that pulls me into the kitchen even more than usual! These gingerbread cookies have a great spice to them and bake up firm, but soft on the inside, so you can build a house and enjoy eating them too! 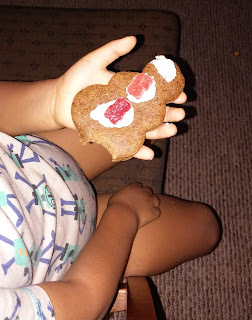 This year, instead of sticking these cookies together, we used my Gingerbread to make a house. 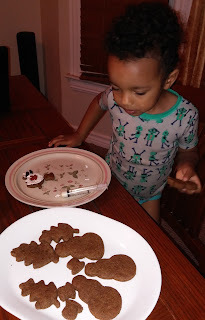 Then, we used these cookies in the shapes of snowmen and trees to add to the decor! Use your favorite royal icing or frosting to decorate them. Depends on the shapes that you cut them in. Prepare the dough at least 3 hours before you are going to bake them. You can even prepare the night before and let it sit in the fridge overnight. Mix together all remaining dry ingredients. Mix dry into wet ingredients until dough begins to form. Once the dough starts to form I use my hands to mix the remainder and form dough into a ball. Cover with plastic wrap and let chill in the fridge for at least 3 hrs. 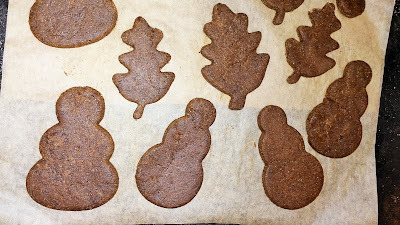 If you don't let the dough chill long enough, rolling it out to cut your cookies will be very difficult and they will likely spread when baking. 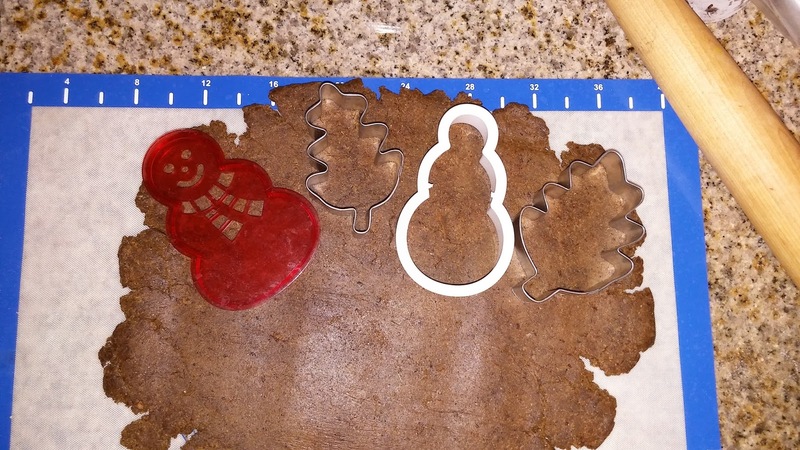 Prepare a cookie sheet with layer of parchment paper. Once your dough is chilled, you can roll it out. 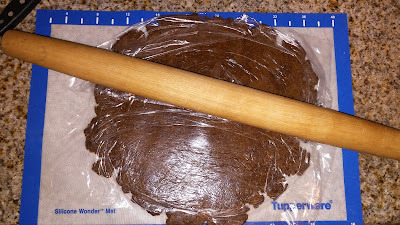 I leave the dough covered with plastic and roll out on a silicone mat. This way, I don't have to use additional flour. You can also, roll out on a floured surface, using a floured rolling pin as well. Roll out dough to 1/4 inch thickness. You can adjust thickness depending on what you will be doing with the cookies. If you are using them to build a house, making the walls a bit thicker than the roof works well. Lay your cookie shapes on the baking sheet and bake at 350 degrees for 10 minutes. Allow cookies to cool completely before working with them. We used dried fruit, nuts, peppermint marshmallows and fruity bears that we had already to add fun touches. 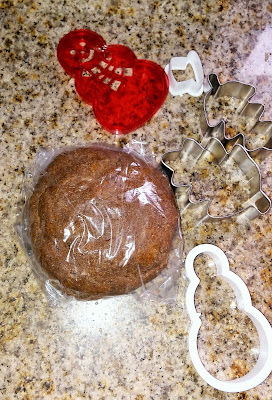 Disclosure-This post contains affiliate links for the products that I use to bake with. If you click and purchase from them, I will be compensated.